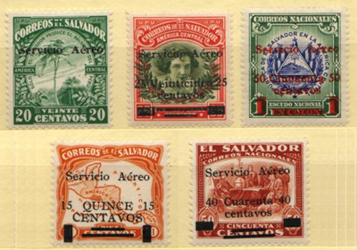 The Salvadorian air post service was established when Pan American Airways informed the government that it would be ready to accept mail for transportation effective 15 December 1929. As the government did not had yet special stamps for the service, it was postponed until 1 January 1930. The first issue was prepared surcharging existing ordinary stamps, as the definitive issue was due to arrive later in the year. To comply with the new postal tariffs, the following surcharges were made: 15 cents on 10 cents, 20 cents on 20 cents, 25 cents on 35 cents, 40 cents on 50 cents and 50 cents on 1 colon. The surcharges were made by the Taller Nacional de Grabados. Due to high demand the limited stock of these first surcharges was quickly exhausted. Therefore, the Government made a second printing of all values, except of the 40 cents. This second printing was done by the Tribunal Superior de Cuentas because of the need to have them as soon as possible. There are several varieties for each surcharge in both the first and second printings. In general, they all occur in the same position on every sheet. Pan American Airways started its three days a week flights on 15 December 1929. Its Ford NC 9670 airplane flew from Guatemala to San Lorenzo in Honduras and returning to Guatemala the same day. In both flights, airplanes stopped in the San Salvador airport named Ilopango. All the first day mail was cancelled with an special cachet. Cachet "A" (left) was used in a few pieces because of regulations forbidding the use of the coat of arms. Because of that, 97% of covers have cachet "B" (right). All covers have cancellations "C", "D", "E" AND "G". and registered mail was cancelled with cachet "F". On the first day of the service, a total of 1,320 ordinary letters, 252 registered letters, and 75 postcards were carried. The destinations of this inaugural flight were San Lorenzo and Tela (Honduras), Managua (Nicaragua), Puntarenas (Costa Rica), Panama and the Canal Zone in the South. In the North, the destinations were Brownsville (USA), Mexico and Guatemala. Waterlow & Sons Ltd. of London, designed the first air post definitives. 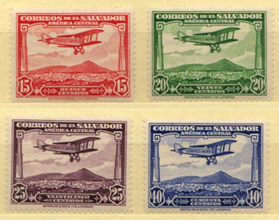 They were issued on 15 September 1930 and show a mail plane over San Salvador.